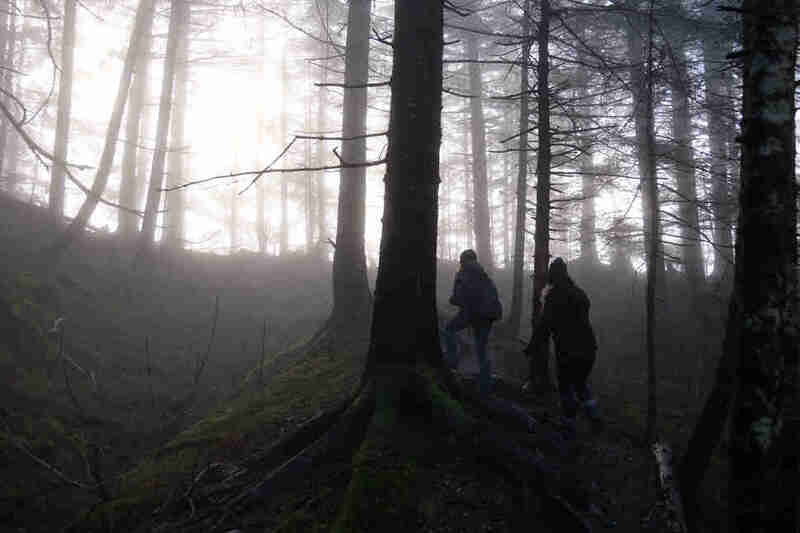 Juneau has more miles of hiking trails than miles of road, so a walk in the woods is pretty much guaranteed while you’re here. 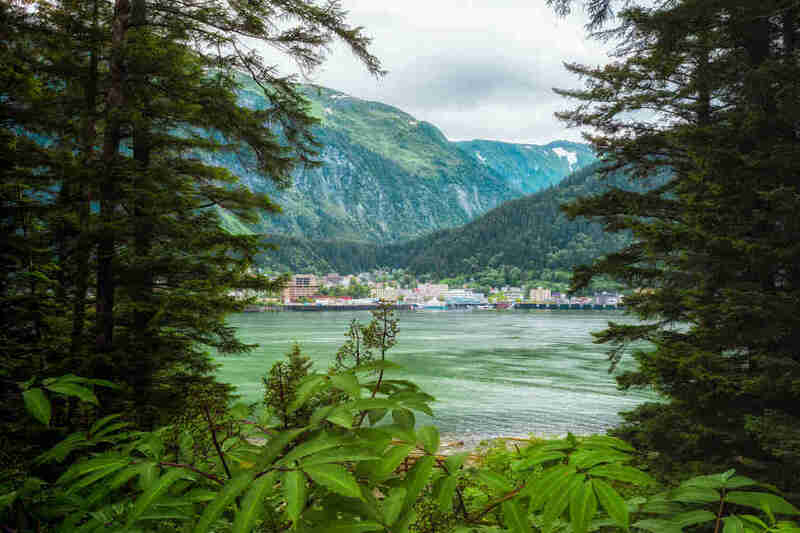 Whether you’re sailing into town on a cruise with a few hours to spare or traveling around Southeast Alaska on your own agenda, hiking in Juneau is the absolute best way to immerse yourself in this incredible majestic landscape. Hell, you might even come across a black bear flipping up rocks by a wilderness stream trying to catch the spawning salmon. The hikes below are all easy to moderately challenging and loved by us locals. We’ve even included some hikes for the kiddos. They’ll take you through Pacific coastal rainforest, or up above the treeline into alpine areas. Some offer sweeping panoramic views of Juneau and the islands beyond, others get you up close and personal with the Mendenhall Glacier. All of them will take you far away from your troubles and into the majestic backcountry of this beautiful region. If you’re an experienced hiker looking for something challenging, you can pick up the Forest Service’s Juneau Area Trail Guide topographic map, available for purchase at Hearthside Books downtown and at Mendenhall Glacier Visitor Center. And no matter what, don’t forget a daypack, water, some snacks, rain gear, and extra warm layers. The weather out here could change in an instant. Views from the Mt. Roberts Tramway | L: Harry M. Walker/Design Pics/Getty Images; R: Blaine Harrington III/Getty Images. A popular activity for cruise ship visitors is to hop on the Goldbelt Mount Roberts Tram, located just south of the cruise ship docks. The tram lifts you 1,760 feet up Mt. Roberts and drops you at the tram’s topmost terminal. 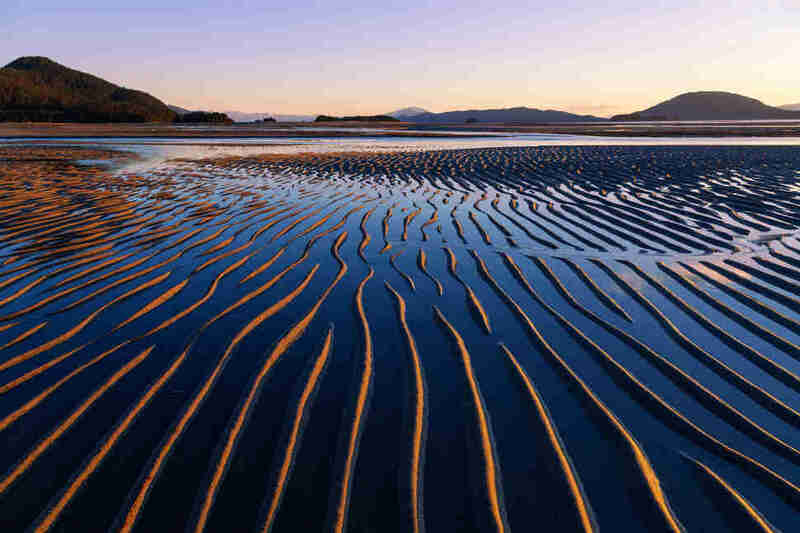 Here at the treeline you’ll take in majestic views of Juneau and the surrounding channels and islands. You can take a leisurely stroll along two short walking loops, both of which are paved and ADA accessible. 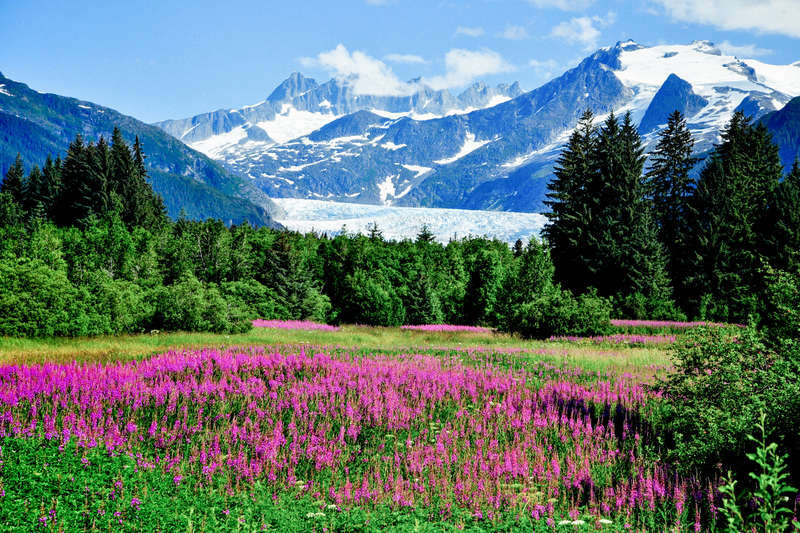 You’ll see unique flowers and alpine vegetation, plus a raven’s-eye view of downtown Juneau, Gastineau Channel, Douglas Island, and all the tiny cruise ships in port. Or, head uphill on the gravel trails that can be a bit steep at times, but are relatively easy for the first 0.3 mile. Viewpoints offer sweeping panoramas stretching all the way to Admiralty Island. Atop Mount Roberts you can also grab a bite at the Timberline, a bar and grill specializing in seafood, or visit the Chilkat Theater where you can watch an award-winning film on Tlingit history and culture and hit up the gift shop. Getting there: Tickets and the entrance to the Goldbelt Mount Roberts Tramway are at 490 S Franklin Street, just south of downtown Juneau and the cruise ship docks. ($34/adult; $17 for children 3-17; free 2 & under). Bonus hike: You can continue hiking a moderately difficult trail to Gold Ridge (2.4 miles round trip; 1,500 feet above Tram) or Mt. Roberts Summit (5 miles round trip; 2,000 feet above Tram). Above the first 0.3 mile, many visitors underestimate this trail, so be sure to prepare for these hikes like you would for any other hike. Tip: You can hike up and ride the tramway back down if you choose, for the cheaper one-way price of $10, which you’ll pay for at the upper tramway station. 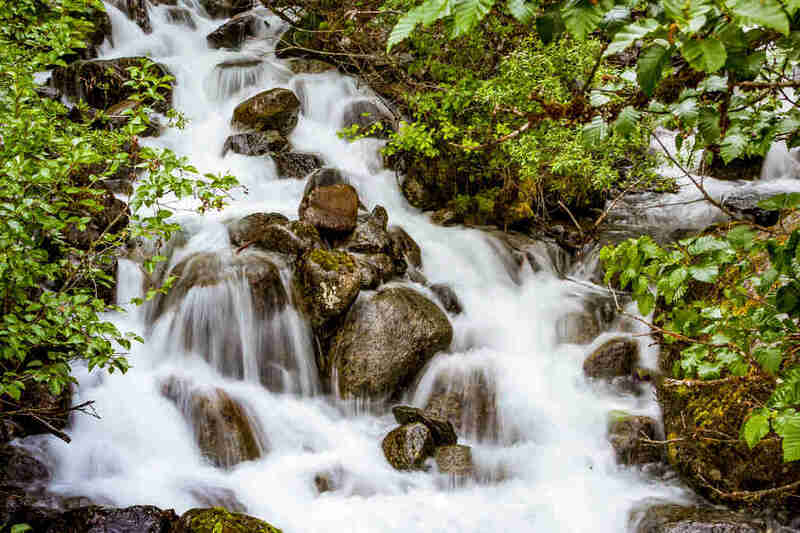 For hikers who want more of a challenge than riding the Goldbelt Mount Roberts Tramway, this trail climbs briskly through coastal temperate rainforest then transitions into the open alpine with beautiful summertime flowers. 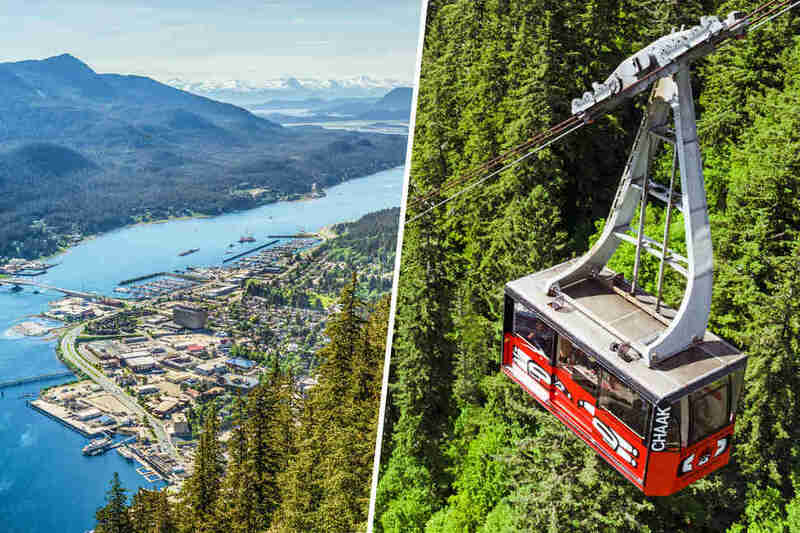 The trail ultimately connects to the upper station of the tramway, where you can continue on the trails mentioned above and take in sweeping panoramas of Juneau and the islands below. Getting there: The Mount Roberts trailhead is at the parking lot on Basin Road, 1 mile from downtown. If you’re walking there from downtown, you’ll take N. Franklin Street uphill, turn right on Sixth Street, then left on Basin Road. Tip: There is no cell phone service in this area. The Herbert Glacier Trail begins in beautiful mature Sitka Spruce/Western Hemlock forest with Devil’s Club and blueberry understory. The first 3 ½ miles of the wide gravel trail is easy for walkers of all ages and abilities. It follows a horse tram route from the gold rush days where you can spot antique vehicles disintegrating into the brush. The remainder of the trail is easy-moderate with the option to view the spectacular Herbert Glacier above the floodplain of the river. Caution: Attempting to get closer to the glacier requires bushwhacking and serious boulder scrambling. Getting there: The hike begins at the parking lot just past the Herbert River bridge, 26 miles north of Juneau. To get there you’ll hop on the Egan Expressway from downtown -- it’s the only road running north out of town. If you take a taxi, just be sure you have cell phone coverage or arrange a taxi pickup time. Perseverance Trail is a popular lunchtime hike and running route for locals who work downtown. It can be reached by a short taxi ride from downtown, but the uphill walk to the trailhead is also stunning, at points rising steeply through some of the oldest neighborhoods in Juneau. 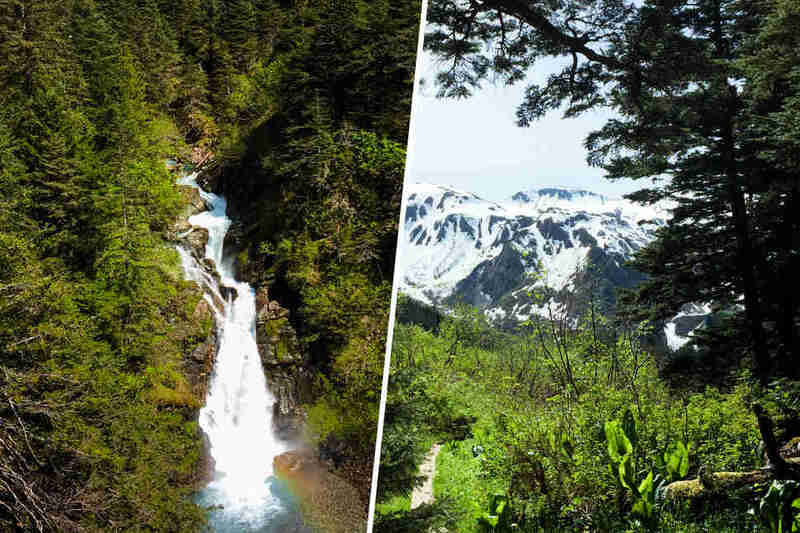 A hike through this deep valley behind downtown Juneau offers views of towering peaks, waterfalls of Gold Creek, and many wildflowers in the summer. During the heyday of Juneau’s gold mining industry, this valley was home to the first road ever constructed in Alaska and several thousand miners. Occasionally the old mine shafts, rails, and equipment are still visible, but the valley now echoes only with the sound of Gold Creek splashing below and the thundering pulse of Ebner Falls. After 20 minutes (0.3 mile) of moderate uphill hiking from the Perseverance trailhead, you’ll come to a viewpoint for the gushing 879-foot Ebner Falls. Once past the Ebner Falls viewing point, the trail becomes less steep, gradually rising as it follows Gold Creek. Getting there: Head to the Mount Roberts trailhead, located in a parking lot on Basin Road just 1 mile from downtown. (If you’re walking there from downtown, you’ll take N. Franklin Street uphill, turn right on Sixth Street, then left on Basin Road.) Continue on the Mount Roberts trail for another half-mile to the Perseverance Trailhead. Excellent signs with maps are posted at junctions with other primary trails, along with historical information. This 3-mile round-trip trail branches off 2 miles from the Perseverance trailhead and offers incredible views of the valley. It’s steeper but well-maintained, and may be blocked by snow into early June. Stop just above the lovely waterfall surrounded by magenta fireweed flowers (late June-July). Be aware that the Mount Juneau Trail branches just past the Ebner Falls view point. A very steep hike with drop-offs and unstable footing, this climb is for very experienced and physically fit hikers only. Several trails around the Mendenhall Glacier Visitor Center offer excellent views of Mendenhall Glacier and Mendenhall Lake. The visitor center is located 13 miles from downtown Juneau -- you can take a taxi, but the cheapest ride is the Mendenhall Glacier Shuttle from the Mt. Roberts Tramway parking lot. It runs every 30 minutes and is $45 round trip. When you arrive, check with the Forest Service staff in the parking lot or at the visitor center for up-to-date information about where you’re most likely to see bears and which trails are open or closed. Their trail map is available here. Interpretive signs along the trails provide useful information about the forest, habitats, and glacier. Note: The Forest Service charges a $5 fee for access to the visitor center, Photo Point Trail, and, most notably, the restrooms. They do accept America the Beautiful Interagency Passes. None of the other trails near the visitor center require the fee. Mendenhall Glacier is retreating rapidly due to climate change and calving into Mendenhall Lake. When the visitor center was built in 1962, the glacier was just below it. 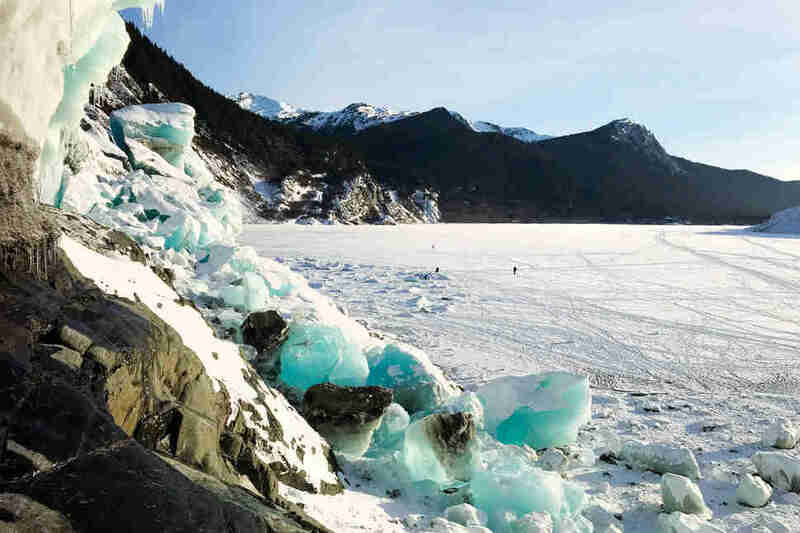 By 1992 when I moved to Juneau, the ice was even with Nugget Falls. Since then it has retreated 0.85 mile, and soon will no longer calve ice into the lake. 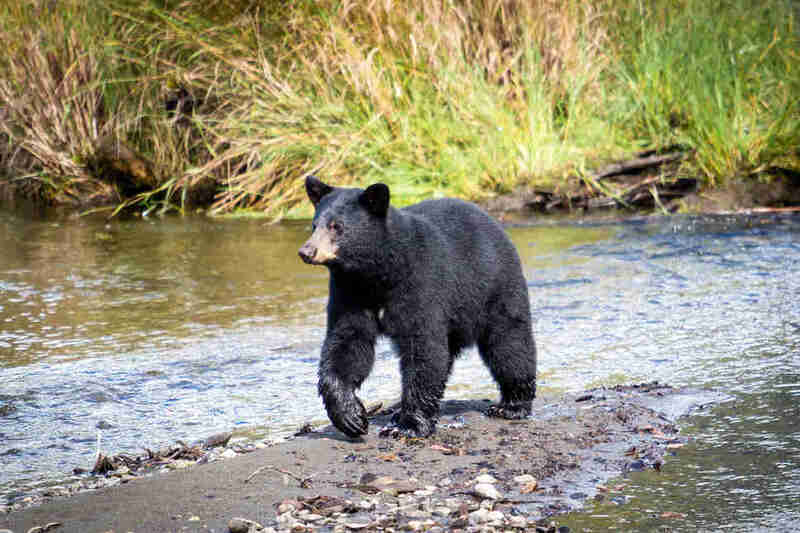 Locals often start with Steep Creek Trail because it’s usually your best bet to observe bears, especially from July 1 through September when salmon are in the streams. In fact, because bears move around and opportunities to see them change, I often walk this quick trail and boardwalk at the beginning and the end of my visit to double my odds. Getting there: The trail starts from the visitor center parking lot. The Trail of Time runs from the visitor center through a coastal temperate rainforest of Sitka spruce and western hemlock. It includes several loops that cross Steep Creek and run along small ponds. The Forest Service usually stations an interpreter at stream crossings where bears are active during the salmon season. The trail has two trailheads that give access to the Glacier Spur Road (the access road to the glacier). Getting there: There is access from the visitor center, or the trailheads along Glacier Spur Road. 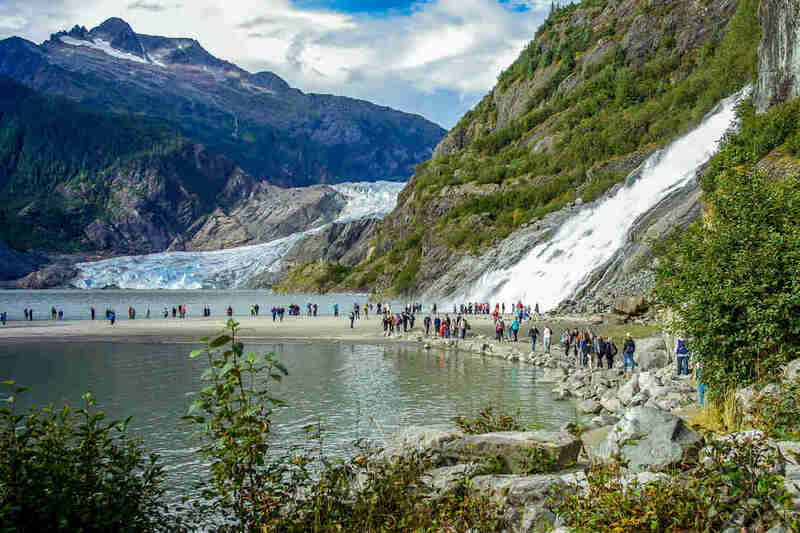 Some of the best views of Mendenhall Glacier and Mendenhall Lake, along with Mount Stroller White and Mount McGuiness can be found on East Glacier Trail. 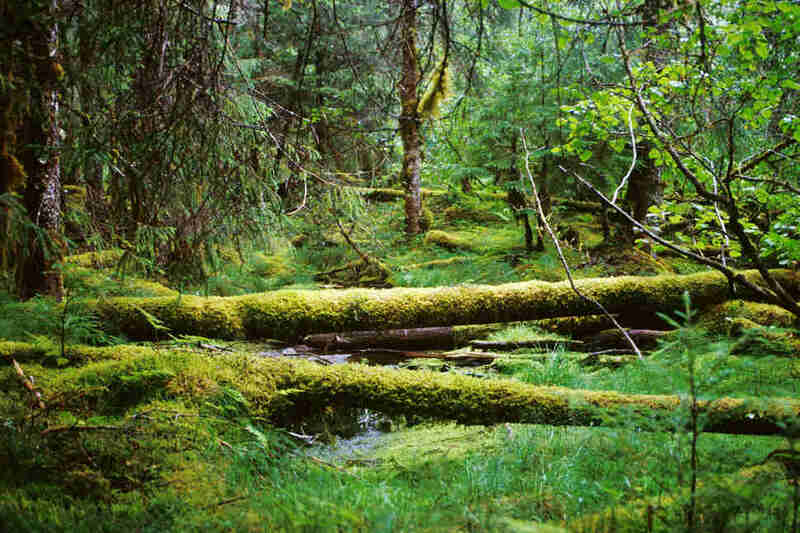 A favorite among locals, the trail crosses cascading streams, climbing through coastal temperate rainforest. As it approaches its highest point (on a long stairway), stop to listen and look down through the Sitka spruce and western hemlock trees. Even though they are tall, much of this area was harvested during the gold mining days around 1900. Getting there: East Glacier Trail goes uphill from two connections on the Trail of Time. The intersections are marked. At 377 feet high, Nugget Falls roars off the mountainside between the visitor center and the glacier. You can get close enough to stand in the spray from the waterfall. When I first moved to Juneau in 1992, the glacier was almost a mile closer to Nugget Falls. Now, the trail drops down from beside the visitor center onto the gravel floodplain left behind by the glacier and the lake. Watch for arctic terns that are nesting between the lake and the trail (you’ll spot them by their black heads and long red beaks) and be sure to obey any restrictions on access marked by signs. The terns spend winter at the southern tip of South America and summer here in Juneau. I see many young families coming through town, both off cruise ships and on their own independent travels, so I feel obliged to add a section here for the kiddos. The only downside here is you’ll need a car or taxi to reach these trails (any of the “easy” trails above would be fine for small children as well). Eagle Beach is a favorite for all locals. At low tide, you can walk more than half a mile out on the tideflats where you’ll see geese, ducks, gulls, and seabirds. Close to the water’s edge you’re likely to see seals and perhaps a sea lion. Gaze out to sea, you might even spot the plume of a whale spout. In the distance, the Chilkat Mountains rise thousands of feet above the saltwater channels. Kids love this place with lots of room to roam, picnic tables, and zillions of places to get muddy and wet. We used to bring our kids here in swimsuits so they could take running bellyslides in the mud (not a great idea since it smells a bit marshy). So, bring a towel and a change of clothing. Getting there: Eagle Beach is 27 miles north of Juneau. Start on Egan Expressway from downtown and just keep driving. It’s the only road running north out of town. The Rainforest Trail drops about 100 feet on a gently sloping path through lush forest. This quiet walk leads through a variety of habitats, depending on how you walk the loop. Kids love the walk and exploring the beach, complete with rocky tidepools. It’s a wonderful place for a picnic, although note there are no picnic tables. Getting there: At mile 11 ½ on North Douglas Highway. Turn right after crossing the Douglas Bridge from Juneau. This requires a car or taxi ride (be sure you have cell phone coverage or arrange taxi pickup time).